Logical Partitioning (LPAR) provides the significant capability to run multiple operating systems, each a partition on the same physical processor, memory, and I/O attachment configuration. LPAR is often discussed along with the concept of server consolidation. LPAR enables management across a single set of hardware and, when configured and managed correctly, can maximize efficient use of hardware resources all in a single place, often using resources in one partition when not needed by another partition. By its nature, LPAR is powerful, but, as the number and complexity of applications being run in each partition increases, can become complex to configure and to achieve anticipated performance expectations. 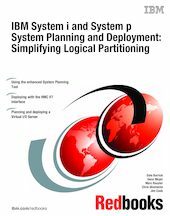 This IBM Redbooks publication describes and provides examples of using the 2007 enhancements to the system planning and deployment tools and processes for planning, ordering, and deploying a partitioned environment on IBM System i and IBM System p configurations. The objective is to help you order and IBM deliver a hardware configuration and get that configuration up and running your planned partition configurations with good performance in as short a time as possible. This book and the tools and processes involved represent the next step in expediting this entire process, while still requiring sound knowledge of IBM System i and System p hardware processor and I/O capabilities for success.